Baked apples are a simple side dish which are perfectly paired with either pork or poultry. When baked with Bigelow� Cinnamon Stick Tea, they become a rustic autumn substitute for applesauce. Alternatively, serve the baked apples with ice cream for a delicious dessert! Baked apples are a simple side dish which are perfectly paired with either pork or poultry. 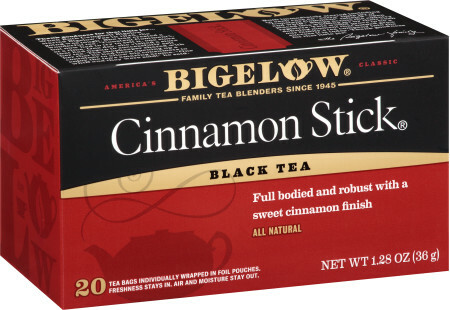 When baked with Bigelow® Cinnamon Stick Tea, they become a rustic autumn substitute for applesauce. Alternatively, serve the baked apples with ice cream for a delicious dessert! Preheat oven to 400º and place rack in middle of oven. In a measuring cup, steep tea bags in hot water for 5 minutes. Thoroughly squeeze tea bags into cup before discarding. Add 3 tablespoons brown sugar to tea and stir until dissolved. While tea is still hot, add butter and stir to combine. Set aside. Horizontally slice the top of each apple off and reserve. Using a melon baller or spoon, scoop out the core and seeds of the apple, making sure not break through the bottom. Place the apples in a 8 x 8 inch ( or 7 x 10) glass or ceramic baking dish and spoon 1 teaspoon of brown sugar into each cavity. Gently pour prepared tea over the top of the apples and bake for about 40 minutes, or until apples are soft. Place the baked apples on a platter and transfer ⅔ cup of the juices to a small saucepan. Boil until slightly thickened, about 10 minutes. Pour juices over the top of the apples and serve warm.